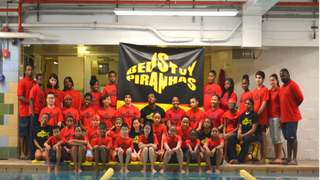 Members of the Piranhas swim team of the Bedford-Stuyvesant YMCA in Brooklyn, N.Y. While lots of other kids are sleeping in and playing video games this summer, a group of dedicated swimmers are hard at work, preparing for the upcoming competitive season. The Bedford-Stuyvesant YMCA Piranhas team, in Brooklyn, N.Y., has won nearly a dozen trophies since forming in 1997. This year’s team has 45 swimmers, the majority African American. Eighteen of the team’s swimmers qualified to compete at the state championship level—an accomplishment that few black athletes achieve. They’re among the most elite swimmers in New York. But their skill and speed in the pool didn’t happen overnight. One mother, Talene Perry-Renwick, made a bold decision: She introduced her two children to swimming at just 8 months old. And while these young people are making waves on the competitive stage, they’re also breaking stereotypes about African Americans and swimming, and setting an example that could go a long way to saving lives. According to the national Centers for Disease Control and Prevention, black children ages 5-19 drown in swimming pools more than five times the rate of white children. Their lack of swimming skills ends, all too often, in tragedy. Samuels, 33, understands many of the challenges his team faces. He learned to swim in high school and fell in love with the sport. Some of his friends tried to discourage his passion for swimming and suggested other sports that are more traditional for black athletes. But he ignored them and competed successfully at the state level. He admits that the Piranhas face some disadvantages. For one thing, most of them started competitive swimming later than their competitors did. And other teams have facilities to be able to practice year-round, while the Piranhas have to give up their pool to summer campers. However, Samuels levels the playing field by instilling commitment and hard work in his team. During the YMCA’s offseason, they practice “dry land” swimming, stretching and weight training to improve their speed. He also addresses the pink elephant in the room: race. Most of the other teams—and the spectators—are predominantly white. That could create a tremendous amount of pressure on his team. His pep talk goes something like this: “Look, the other kids have been swimming for a long time. But you’ve put in a lot of hard work, and we’re here for a purpose.” Despite the disadvantages, the Piranhas finish at the top. The disparity is rooted in this country’s racial history. During segregation, African Americans had few options if they wanted to learn how to swim. At the same time, erroneous academic studies said black people lacked the buoyancy whites have. That myth, says a diversity specialist with USA Swimming, continues to fuel the misperception that black folks can’t swim. Theresa Edwards says her son Korey Soomai, 14, learned to wrestle and play football early. But the family never considered swimming until four years ago while on vacation. She recalls seeing black children in a hotel swimming pool flopping their arms and legs around in a frenzied motion. Korey, who aspires to be an Olympian, says he loves competitive swimming. “It gives me a chance to test myself against other people,” he says, exuding confidence. Korey and the other Piranhas are fortunate to have Olympic role models. Gold medalist Cullen Jones and bronze medalist Lia Neal have met the team and given the team priceless lessons. Some team members, like Laila and Maya McCormock, point out that swimming offers a path to a successful future. The sisters, 12 and 13 years old, are working toward earning college swimming scholarships. The Piranhas are a close-knit group—for life. Caitlin Hackett, 19, describes the team as a family. She learned at 10 how to swim at the YMCA and later earned a spot on the team. She’s now a lifeguard and a swimming instructor there. Samuels says he spotted her leadership abilities early and began to nurture those skills. She no longer swims competitively but enjoys training the next generation of Piranhas. The swimming season begins in September, and the Piranhas are determined to add another trophy to their collection.